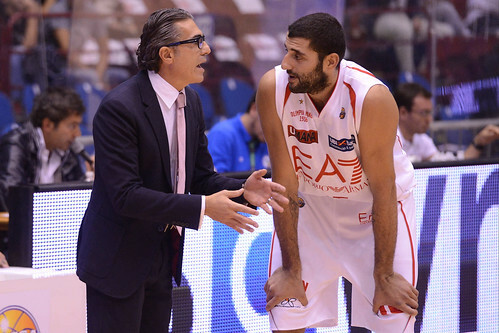 Sergio Scariolo on EA7 Emporio Armani debut against Andolu Efes Istanbul: “We play a team traditionally very strong, with legitimate aspirations, a great roster of players including some guys who come from the NBA where they actually played important minutes. The complementary players are very solid, too. We must be sure to understand that winning will take a big effort. In a competition so short, like the Euroleague’s regular season, in spite of the process of developing the team going on, we need to keep the intensity very high since the very first game”. Sergio Scariolo on the EA7 group: “It’s very demanding, like everybody agrees. All the teams have the tools, the players, everything in order to advance in the Top 16. So the only thing to do is to play game by game, realizing that every game is very important from the beginning”. Sergio Scariolo on his team: “We’re obviously a work in progress. During some spurts we can be very brilliant then we have some letdowns during the course of the same game that we want to eliminate as soon as possible. What’s important is to improve our physical condition and improve also the chemistry between new players and the old ones. That’s will allow us to reduce the ups and downs”. Ioannis Bourousis about the first game EA7 Emporio Armani is going to play on Friday against Anadolu Efes Istanbul: “It’s the first game and I hope to start the season well, especially playing at home. Efes is a very good team, it’s always been good and this year is no different, so in order to win we need to play a solid game. Our group is very tough and hard to predict, so we need to focus on every single game and try to beat every team we face. I’ll be playing against my former team, Olympiacos Piraeus: it’s the first time so I don’t know what to expect, but overall I’m happy to play against them”.